Line two cookie sheets or rimmed baking pans with parchment paper and set aside. In a large bowl, whisk together the almond flour, baking powder, and salt. Be sure all the clumps are gone from the almond flour. Switch to a silicone spatula and stir in the maple syrup and vanilla. Mix until a sticky dough forms and holds together. With a cookie scoop or tablespoon, scoop up the dough and form it into a ball. Form the ball into a small rectangle about 2 inches long and a ¼ inch thick. Place the cookie on the prepared baking sheet. Repeat with the rest of the dough, placing each cookie about 2 inches apart on the baking sheets. Place the cookies in the oven and bake for about 12 minutes, switching the cookie sheets on the oven racks at the halfway point. The cookies are ready when the edges are golden brown. Transfer the cookies on the parchment paper onto a wire rack, and let them cool completely. Place the chocolate in a small deep glass mixing bowl and place the bowl in the microwave on high for 30 seconds, stir, and place back in the microwave for another 30 seconds. Stir until the chocolate is completely dissolved. Place another piece of parchment paper on a kitchen counter. When the cookies are completely cooled, dip one half of each cookie onto the chocolate. Place the cookies on the parchment-lined sheet. Repeat until finished. Leave at room temperature until the chocolate hardens. Store the cookies in an airtight container for up to 3 days at room temperature or in the refrigerator or place in a freezer container for up to 6 weeks. In a large bowl, whisk together the almond flour, arrowroot powder, baking soda, and salt. Be sure all the clumps are gone in the almond flour. Add the maple syrup, the vanilla and orange extracts, and water. Fold the chocolate chips and nuts into the batter. On a cutting board, form the batter into a rectangular log, 2 inches wide by 8 inches long and place on the parchment-lined baking sheet. Bake for 20 minutes until lightly browned. Remove the baking sheet from the oven and let cool for 30 minutes. Reheat the oven to 250 degrees F. Cut the log into thin slices with a very sharp knife and place them cut side down on the same parchment-lined baking sheet. Bake for 10 minutes, then turn them over and bake 10 minutes more, watching carefully to make sure they do not burn. Remove the pan from the oven and let cool completely before serving. Christmas baking has begun and I start with cookies. What are your favorite cookies to make for the holidays? Here are some of mine. Separate 3 of the eggs; Beat the 3 egg yolks and the remaining whole egg into the butter-sugar mixture. Set aside the eggs whites and use for another recipe, such as the Pignoli cookies below. Preheat the oven to 350 degrees F. Cover the baking sheets with parchment paper. Divide the dough into four equal parts. On a lightly floured surface, roll out one-fourth of the dough to 1/8-inch thickness. Cut out shapes with floured cookie cutters. Transfer cookies to baking sheets. Repeat with remaining dough and re-roll scraps until all the dough is used. Bake for 8-10 minutes, or until the edges of the cookies are lightly browned. Cool. Store in tightly covered containers for up to one month in a cool place, or freeze for up to 6 months. Makes 2 dozen. I usually double the recipe. Heat the oven to 325°F. Line cookie sheets with parchment paper. In mixer bowl beat almond paste, sugar, egg whites and almond extract with an electric mixer until smooth. Drop a heaping teaspoonful of dough 1 inch apart on prepared cookie sheets. Sprinkle with pine nuts to cover, then press them gently to adhere. Bake 20 minutes or until the tops feel firm and dry when lightly pressed. Cool completely on cookie sheet on wire rack. Store airtight at room temperature. I don’t have much of a sweet tooth, so generally desserts are not often on my menu. When I do want something to go a cup of tea, it would be a biscotti. I tend to not make them very sweet. Here are two of my favorites. The chocolate ganache is optional. These cookies can also be made gluten-free, if almond flour is substituted for the all-purpose flour. Preheat oven to 325 degrees F and line a large baking pan with parchment paper. In a medium bowl, combine the flour, sugar, baking powder and salt. Stir in the chopped pecans. In a small bowl combine the eggs, molasses and vanilla extract. Add to the dry ingredients and mix with a fork until the dough comes together. Turn dough out onto parchment lined baking pan and form into a log 4 by 10 inches. Bake about 25 minutes, until golden brown and just firm to the touch. Remove the pan from the oven and let the biscotti log cool for 20 minutes. Using a sharp, straight-edge knife, slice into 14 or 15 even slices . Space the slices a few inches apart on the baking pan and bake 10 minutes. 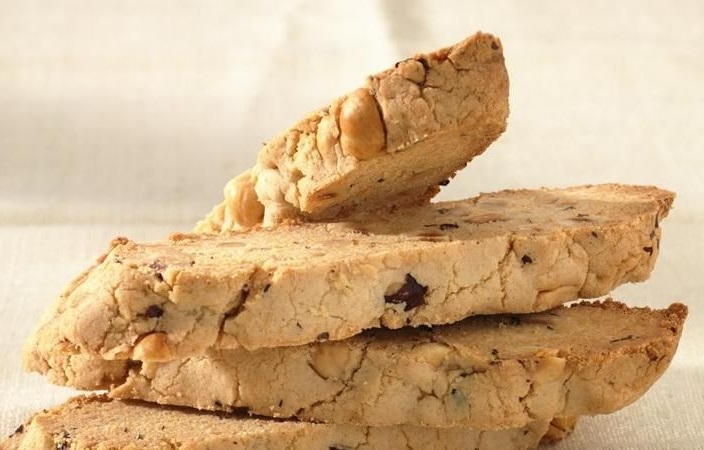 Turn the biscotti slices over and bake 10 minutes more. Remove the pan from the oven and let cool. They will continue to crisp up as they cool. Slide the parchment onto the kitchen counter to cool the biscotti completely. Dip one end of the biscotti in the chocolate ganache and let dry on the parchment paper. Preheat the oven to 325 degrees F and line a large baking pan with parchment. In a medium bowl, whisk together the flour, sugar, pumpkin pie spice, baking powder and salt. In a small bowl combine the pumpkin puree, egg, oil and vanilla extract. Turn the dough out onto the parchment lined baking pan and pat the dough into a log 4 by 10 inches. Bake for 25 minutes or until the log is just firm to the touch. Remove the pan from the oven and cool the biscotti log for 20 minutes. Reduce the oven temperature to 225 degrees F.
Gently slice the log into 12 even slices using a serrated knife. Place the slices back on the baking pan on their sides and place the pan back into the oven. Let bake 15 minutes and then turn the biscotti slices over and bake 15 minutes more. Remove the pan from the oven and let cool. They will firm up as they cool. Makes enough for both recipes. Finely chop the chocolate and place it in a small microwaveable bowl. Microwave for 30 seconds. Add the cold heavy cream and microwave for 30 seconds. Add the butter and gently whisk to combine. The ganache should be thick and glossy. Christmas cake is an English tradition that began as plum-porridge. People ate the porridge on Christmas Eve, using it to line their stomachs after a day of fasting. Soon dried fruit, spices and honey were added to the porridge mixture and, eventually, it turned into Christmas pudding. 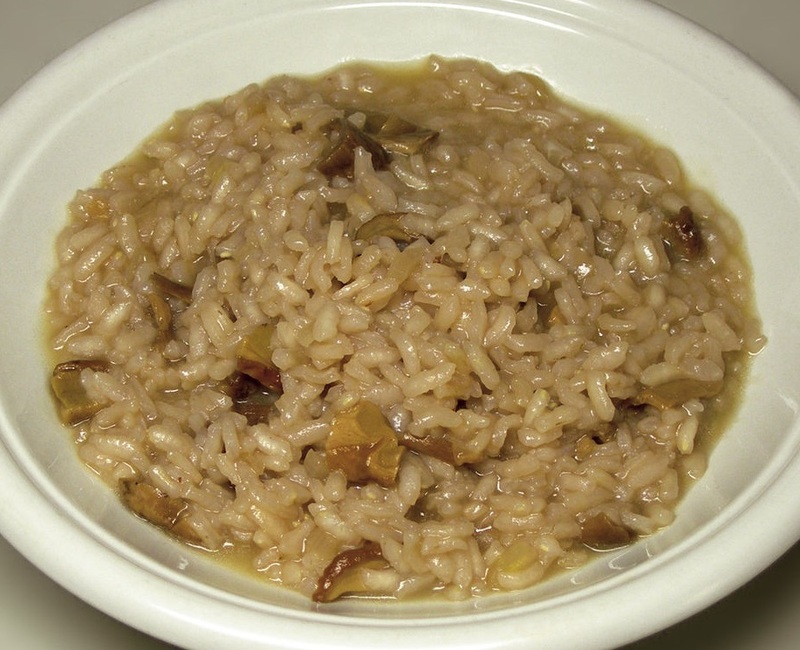 In the 16th century, oatmeal was removed from the original recipe and butter, wheat flour and eggs were added. These ingredients helped hold the mixture together, resulting in a boiled plum-cake. Richer families with ovens began making fruit cakes with marzipan, an almond paste, for Easter. For Christmas, they made a similar cake using seasonal dried fruit and spices. The spices came from the eastern countries and this cake became known as Christmas cake. Christmas cakes are made many different ways, but generally they are variations on the classic fruitcake. They can be light, dark, moist, dry, heavy, spongy, leavened, unleavened and more. They are made in many different shapes, with frosting, glazing, a dusting of confectioner’s sugar or just left plain. The traditional Scottish Christmas cake, also known as the Whisky Dundee, is very popular. It is a light crumbly cake with currants, raisins, cherries and Scotch whisky. Other types of Christmas cakes include apples and mincemeat. In Japan, Christmas cake is a frosted sponge cake with strawberries, chocolates or seasonal fruit. In the Philippines, Christmas cake is a yellow pound cake with nuts. Don’t forget the traditional British fruitcake that is soaked in brandy or rum, sugar syrup and water. Italy has a long culinary tradition of serving cakes and sweets during the Christmas season. The tradition of “dolci di Natale” is long and varied with hundreds of types of cakes, cookies and sweets on the Christmas table. Every table for sure has Panettone and Pandoro – the symbols of Christmas in Italy. Following are some modern day fruit style cakes. Grease a 13 x 9 x 2 inch baking pan or a 3-quart rectangular baking dish; set aside. Preheat the oven to 350 degrees F.
In a large bowl combine cream cheese, granulated sugar and butter; beat with an electric mixer on medium speed until smooth. Add 3/4 cup of the flour, the eggs, milk, baking powder, baking soda, vanilla and salt. Beat about 1 minute more or until combined. Add the remaining 1 cup flour, beating on low-speed just until combined. Spread batter evenly in the prepared baking pan. In a small bowl stir jam with a spoon until nearly smooth. Spoon jam in eight to ten mounds on top of the batter in the baking pan. Using a thin spatula or knife, swirl jam into the batter. Bake for 30 to 35 minutes or until a toothpick inserted into the cake portion near the center comes out clean. Cool cake in the pan on a wire rack for 30 minutes. Dust with powdered sugar and, if desired, serve with raspberries or other fruit. Serve warm. Stir sugar, cornstarch, ginger and finely shredded orange peel in a small saucepan. Stir in orange juice. Cook and stir over medium heat until mixture is thickened and bubbly; cook and stir 2 minutes more. Remove the pan from the heat. Stir in butter until melted. Cover pan and cool slightly. Serve warm. Makes about 1 cup. Grease and flour an 8 x 8 x 2-inch baking pan; set aside. Stir together the 1 cup flour, baking powder and baking soda in a small bowl; set aside. Preheat the oven to 350 degree F oven. Place softened butter and ginger in a medium mixing bowl; beat with an electric mixer on medium speed for 30 seconds. Add sugar; beat until fluffy. Add egg; beat well. Stir in yogurt and milk. Add flour mixture, beating on low to medium speed until combined. Toss dates with 2 tablespoons flour and fold into the batter. Spread batter evenly in prepared pan. Bake in the preheated oven for 30 to 35 minutes or until a toothpick inserted in the center comes out clean. Cool slightly (about 30 minutes) in the pan on a wire rack. Cut into squares. Serve with warm Orange Sauce. Preheat the oven to 350 degrees F. Line a 9 x 9 x 2 inch baking pan with foil, extending the foil over the edges of the pan; set aside. In a large bowl, stir together flour, oats, brown sugar, pecans, lemon peel and baking soda. Stir in applesauce and oil; mix well. If necessary, use your hands to combine. Measure 1 cup of the oat mixture; set aside. Press the remaining oat mixture into the bottom of the prepared baking pan. Bake for 20 minutes. Carefully spread the preserves evenly over the hot crust. Sprinkle with the reserved 1 cup oat mixture; pat gently into preserves. Bake about 30 minutes more or until top is lightly browned. Cool in pan on a wire rack. Using the edges of the foil, lift the cake out of the pan. Serve warm. With the paddle attachment, combine all the ingredients in the large bowl of an electric mixer. Switch to the dough hook and knead the dough until soft and shiny. Place in a greased bowl and let rise, covered with plastic wrap, until double. In a small bowl, stir together chocolate and dried plums; set aside. Remove dough from the bowl to a lightly floured surface; punch down dough. Cover and let rest for 10 minutes. Roll dough into a 15 x 10-inch rectangle. Along the short side (10 inch) of the dough sprinkle about 1/2 cup of the prune mixture over a 3-inch-wide section of the dough. Starting from the opposite side, fold dough over filling, allowing dough to extend beyond the prune-topped dough. Sprinkle another 1/2 cup of the prune mixture on top of the filled layer, pressing filling down lightly. Fold dough back over prune mixture, accordion-style. Repeat filling and folding dough, accordion-style, twice more. Fold remaining dough over the top, pressing lightly. (You will have five layers of dough and four layers of filling.) Gently pat the sides of the dough to form a rectangle. Lightly coat a baking sheet with nonstick cooking spray. Place loaf on the prepared baking sheet. Cover and let rise in a warm place until nearly double in size (about 30 minutes). You can use this dough and filling to make any shape coffee cake – horseshoe, ring, etc. Using a sharp knife, make a shallow lengthwise cut down the center of the top layer, then make several crosswise cuts at 1-inch intervals. To keep bread layers from slipping while baking, insert wooden skewers (one close to each end of the loaf, inserting each skewer at a slight angle) from top through the bottom layer. Bake about 35 minutes or until the bread sounds hollow when lightly tapped. If necessary to prevent over browning, cover with foil for the last 10 minutes of baking. Remove from the baking sheet; cool on a wire rack. Remove wooden skewers. Slice thinly to serve. These are especially good with coffee. Beat butter in a large mixing bowl with an electric mixer on medium to high-speed for 30 seconds. Add sugar, baking powder, baking soda and salt; beat until combined. Beat in the 3 eggs, vanilla and almond extract until combined. Beat in as much of the flour as you can with the mixer. Stir in any remaining flour, anise, fennel seeds, cranberries, pistachios, and apricots with a wooden spoon. Cover and refrigerate for 2 hours or until the dough is easy to handle. Divide dough in half. Shape each half into a 12-inch-long log 1-1/2 inches in diameter. Place logs at least 3 inches apart on a lightly greased cookie sheet. Flatten each log slightly to 3/4-inch thickness. Combine egg and 1 tablespoon water. Brush over logs. Bake in preheated oven for 25 to 30 minutes or until light brown. Cool logs on cookie sheet 1 hour or till completely cool. When logs are cool, preheat oven to 325 degrees F.
Transfer logs to a cutting board. Cut each log diagonally into 1/2-inch-thick slices. Lay slices down on the cookie sheets. Bake in the preheated oven for 5 minutes. Turn slices over and bake 5 minutes more or until dry and crisp. Remove and cool on wire racks. Drizzle with powdered sugar glaze, if desired. 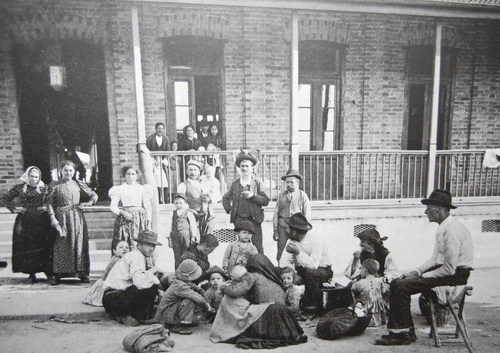 As immigrants from the different regions of Italy settled throughout the United States, many brought with them a distinct regional Italian culinary tradition. Many of these foods and recipes developed into new favorites for the local communities and later for Americans nationwide. Italians were some of the first European explorers and settlers of California. Italians first came to the state in large numbers with the Gold Rush. While most found little gold, they did find success in farming, fishing, commerce and making wine. 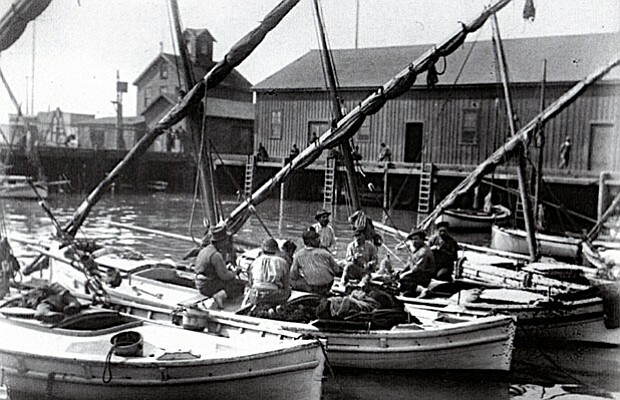 Though we often associate Italians in California with San Francisco, the initial Italian settlers established themselves in such diverse communities as Monterey, Stockton and San Diego. Italian fishermen established themselves in fishing villages along the coast. Across the state, the Italians also settled the farmlands and played a prominent role in developing today’s fruit, vegetable and dairy industries. By the 1880’s, Italians dominated the industry in the great Central Valley of California. Italian immigrants also left their mark on the California food processing industry. Marco Fontana arrived in the United States in 1859 and along with another Ligurian, Antonio Cerruti, established a chain of canneries under the “Del Monte” label. Most of their workers were Italian and their cannery soon became the largest in the world. Another enterprising Italian was Domenico Ghirardelli, who traveled through the gold mines in the 1850’s, selling chocolates and hard candies. He settled in San Francisco after the Goldrush and founded the Ghirardelli chocolate empire. One of the most inspiring of California’s Italians was Amadeo Pietro Giannini who was born in 1870 to immigrant Italian parents from Genoa. He started the first statewide system of branch banks in the nation by opening branches of his Bank of Italy, in the Italian neighborhoods, across the state. He later changed the name of his bank to Bank of America. Many Italian families have made their living from cattle ranching in the Mother Lode foothills at the base of the Sierra Nevada Mountains. One can still find many Italian family ranches in the region. The Italians also played an important role in developing the olive oil industry in the foothills. The rolling hills of the Gold Country, which resemble the Mediterranean hills of Liguria, are dotted with the remnants of early Italian olive tree orchards and with newly planted trees similar to those found in Italy. The California wine industry also owes much to its Italian founders. 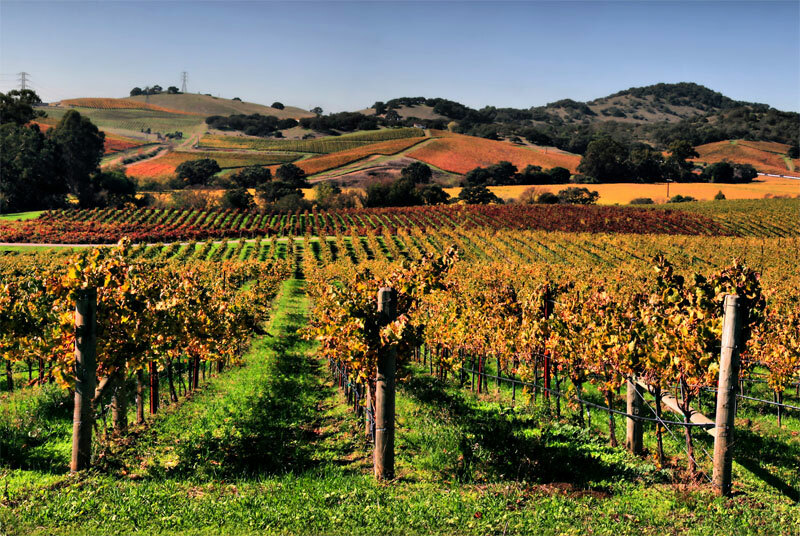 Italians have been planting vineyards and making wine in America since the early colonial days when Filippo Mazzei planted vineyards with Thomas Jefferson. Drive down the California vineyard roads and you may think you are in Italy. The Italian winery names that are seen throughout the area stand as a reminder of the contribution of Italian-Americans in the growth of the California wine industry. Some of the most famous names in American wine got their start during the four decades leading up to Prohibition in 1919. 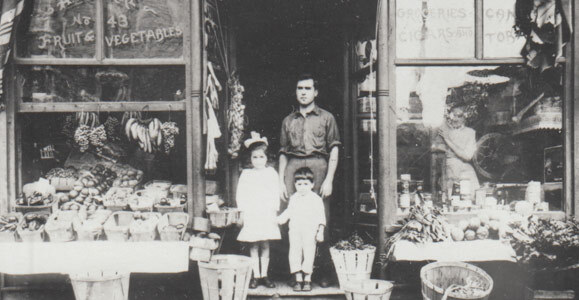 Seghesio, Simi, Sebastiani and Foppiano all started in the late 1800s and are still operating today. Giuseppe Magliavacca’s Napa winery was by then a thriving business, Secondo Guasti had established the Italian Vineyard Company and Andrea Sbarbaro had founded Italian Swiss Colony. 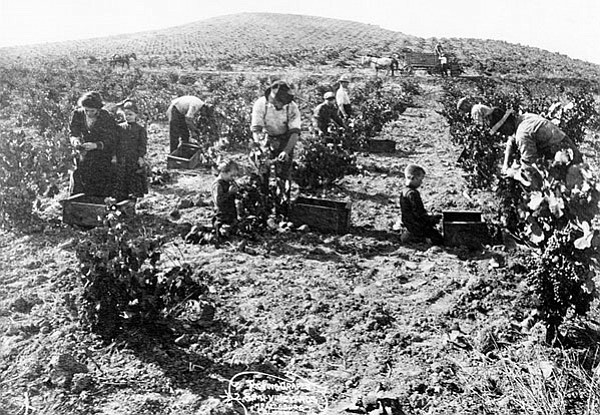 Italian-Americans in California kept their vines in the ground and healthy throughout the Prohibition era. When Prohibition ended, they were rewarded but, more importantly, the families that had struggled to maintain their vineyards gave America a jump start in resuming the wine industry. Without the vineyards and the fully equipped wineries, America would have had to rebuild the industry from scratch, an industry that is synonymous with longevity and tradition. Today, the California wine industry is dotted with Italian names. The Trinchero family name is hidden behind its non-Italian winery name: Sutter Home. Robert Mondavi, Ferrari-Carano, Geyser Peak (owned by the Trione family), Viansa, Cosentino, Atlas Peak (owned by Antinori), Dalla Valle, Delicato, Valley of the Moon, Parducci, Signorello, Sattui, Rochioli, Rafanelli and Mazzocco are all thriving wineries in America. Recipe by Vicki Sebastiani from Viansa Winery. Serve this course with Barbera, a wine flavored with plum, black cherry, wild berry and oak spice. 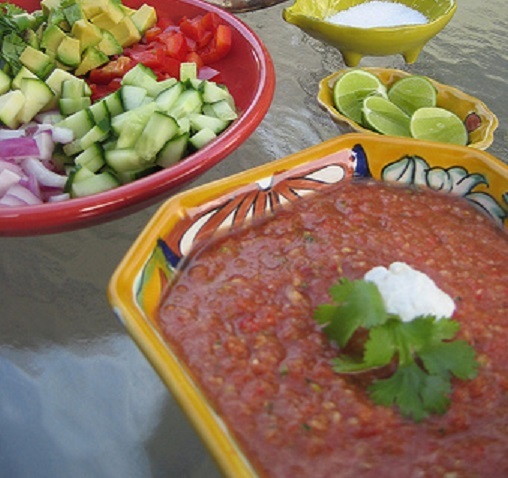 Set aside 1/2 cup each of the chopped cucumber, red onion, red pepper and zucchini. In a blender or food processor combine the rest of the vegetables with the remaining ingredients. Puree slightly, so the vegetables are left a little chunky. Combine soup with the reserved vegetables, cover tightly with plastic wrap and chill 2 to 3 hours. To serve, top with a dollop of sour cream, a sprinkle of minced chives and several croutons. From the kitchen of Ed Seghesio. Serve this course with Arneis, which is both the name of the wine and the grape from which it is made. The name means “little rascal” in the Piedmontese dialect, so named because it can be difficult to grow. Arneis has a delicate aroma and flavor of pears, with a hint of almonds. The grape seems to have more acidity in California than in Italy, yielding a crisper wine. Simmer chicken stock in a separate pan. Sauté onions in olive oil and butter until onions are clear in a large saucepan. Add the rice to the onions and sauté for 5 minutes, stirring constantly. Add the wine and garlic to the mixture and allow the liquid to cook down. Then add 1/2 cup of warm stock and the rehydrated porcini mushrooms with their liquid. Allow the liquid to cook down, stirring constantly. As the liquid simmers, continue adding 1/2 cup of the warm stock. Repeat this process until the rice is tender, approximately 30 minutes. With the last 1/2 cup of stock, add the saffron. When the rice is tender, stir in the Parmesan cheese and freshly ground pepper to taste. Serve immediately. Serves 2 as a main dish and 4 as a side dish. Recipe courtesy of Louis M. Martini Winery. Serve with Sangiovese, a Chianti-style wine. Remove the chicken’s backbone (or have the butcher do it). Lay the chicken out flat. With your fingers, gently separate the chicken skin from the breast and thighs but do not detach it completely. Rub oil all over chicken skin. Spread the tapenade evenly over the breast and thighs and underneath the skin. Season with rosemary, salt and pepper. Cover and refrigerate 3 to 4 hours. Bring to room temperature before grilling. Prepare a medium-hot charcoal fire. Arrange coals in a ring around the perimeter of the grill and set an aluminum foil drip pan in the center. 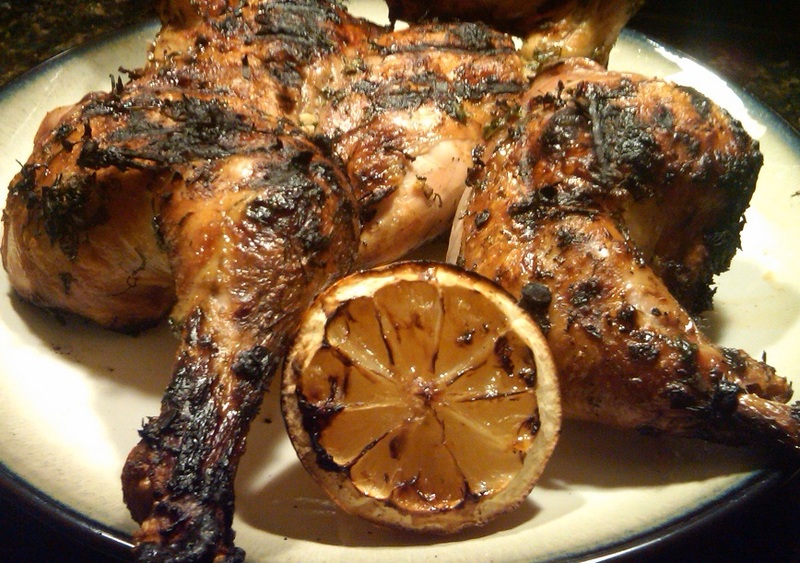 Grill the chicken over the drip pan for about 20 minutes skin side down, with the grill covered; then turn, cover again and cook until done, about another 10 minutes. Let rest 5 to 10 minutes before cutting into serving pieces. Serves 4. Combine all ingredients in a food processor or blender and blend until nearly but not completely smooth. Tapenade should have a slightly coarse texture. Recipe courtesy of the Mosby Winery. Serve with Tocai Friulano, a slightly sweet wine with aromas of honeysuckle and orange blossom along with the flavors of citrus and tropical fruit. Preheat the oven to 350ºF. Grease 2 baking sheets. Combine flour, baking powder, hazelnut flour and salt in the bowl of a food processor. Pulse a few times to blend the ingredients. In another bowl, cream the butter and sugar together with an electric mixer. Add the eggs to the butter and sugar and beat well. Stir in the flour mixture, the coarsely chopped hazelnuts, espresso powder, vanilla and anise seed. Cover the dough and chill for 1 hour. Divide the dough into four pieces and shape each into a 9-inch log. Place the logs on the baking sheets and bake in the oven for 35 minutes. Remove the loaves to a cutting board, cool and cut the pieces crosswise into 3/4” thick slices. Return the slices, cut side down, to the baking sheets and bake an additional 20 minutes, or until dry and firm. Let the biscotti cool before serving. Store in airtight container for up to two weeks.